Dubai, UAE, July 31, 2018: As our cross-country road trip continues in celebration of our 25th anniversary, this season is inspired by America’s beautiful prairies. The collection exudes a pioneering spirit through sophisticated, utilitarian fabrics, details and motifs and a sparkling twang unique to Nashville, Tennessee. Menswear-inspired shapes mix harmoniously with unapologetically feminine silhouettes in a palette of deep blues, faded pinks and russet browns. Indigo denim is featured prominently throughout the collection, from a boxy jacket with studs and a swingy skirt, to trim on a tweed suit. 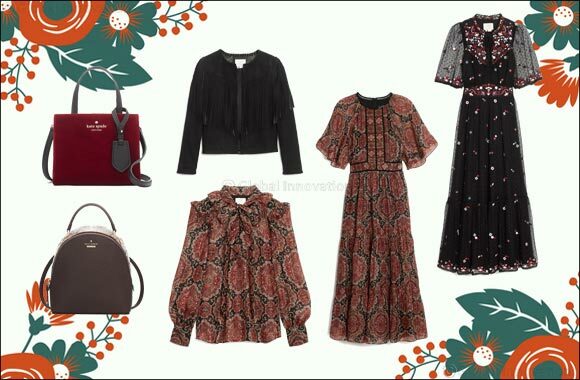 On the print front, calico florals, patchwork and plaid capture the prairie spirit, especially when cast across dresses and blouses with lace, yokes and ruffles. A horse motif on a sweater and dress is a wildly likeable tie-back to the heart of the season. Guipure lace dresses, a multi-yarn tweed suit (with luxe silver threads), drapey silk blouses and a soft suede fringe jacket are just some of the sophisticated fabrications that define the collection. A lightweight, stretch-wool pinstripe pant suit is a standout look that can be worn together or as separates. As we explore new expressions of our original sam bag from 1993, this season we zhoozh summer's bangle-handle style in luxurious suede with fringe detail and croc-embossed leather. We also crafted it in shearling, as well as black and deep red velvet. In addition, a smooth leather boho bucket bag, called vanessa, comes in a variety of hues. Marci, our chain strap shoulder bag, is quilted in graphic zig-zags and also comes in snake-print leather with striking earthy-red tones. In personalization, new flaps in plaid, shearling and with floral flocking offer even more ways to build the dream handbag wardrobe—and pack several bags when travelling. Our favorites this season include studded suede mules and a knee-high leather boot with contrast piping. Earrings are one of the biggest expressions in the collection. Sparkling dusters with rose bud detail live alongside pear-shaped pearl danglers and mismatched pairs. A dazzling duo features horses cascading with rhinestones, and hoops are reimagined in delicate sparkling stars and hearts. Cameo-inspired pieces round out the collection and give it a distinctly prairie feel. With high-performance fabrics engineered for movement, the athleisure collection combines function and fashion. Ruffle detail makes its way onto everything from a prairie rose print anorak to leggings and sports bras. A favorite style is a quilted, puffer poncho that effortlessly slips on and off. Technically speaking, the collection takes on a new look with phone cases adorned in sly foxes and bandana prints, calico florals and scenes of the open road. Upgrades like sticker pockets and a kickstand are also available. The fall sleepwear collection is a dreamy mix of lightweight cotton and silk tops, pant and short sets, robes and rompers in signature colors and delightful prints. Fashion accessories add the finishing touch to the fall collection with foxy belts, bandana scarves and rockabilly-inspired eyewear.